Before we begin, make sure you've been through the introductory Melodic Minor scale lesson and understand the core intervals of the scale. 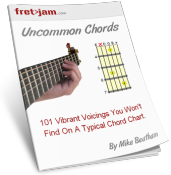 We're now going to expand across the entire fretboard using Melodic Minor scale positions. This will free up your playing and give you more options for moving between different notes in the scale whichever key you happen to be in, no matter where you are on the neck. In the introductory lesson, we learned that the Melodic Minor scale is made up of seven degrees, like most other scales we learn (known as a heptatonic scale). We can see each of these degrees as the starting position for a five-fret-wide "box" pattern. So each degree has its own related "position pattern". The process for memorising scales across the entire neck is always the same. Lay out the scale's sequence across the 6th string and build box patterns on each of the scale's degrees. We then string them together to form one large, neck-wide roadmap that we can move to any root in its fixed formation. The red squares indicate the root positions of these patterns. The easiest way to memorise the sequence of positions is to start by connecting two at a time. For example, connect the first and second positions. Then second and third. Then third and fourth etc. Then try connecting three at a time - first, second, third... second, third fourth... third, fourth fifth etc. Eventually, you should be able to play through the positions, up or down the neck, seamlessly and smoothly. Try challenging yourself to "land" on different tones within the pattern. For example, you could move from root to root throughout the connected sequence. When the root note changes, the entire pattern moves with it. The important thing is you can gauge the position of these root notes from the individual position patterns you learned. So spend time learning each position pattern by heart before you attempt to link them together. Also, as well as linking the Melodic Minor positions together into one large pattern like above, try creating your own larger patterns by linking two or more positions together (for example, three-notes-per-string). This will allow you to use runs and other scale techniques in more economical spaces on the fretboard, especially at higher frets. 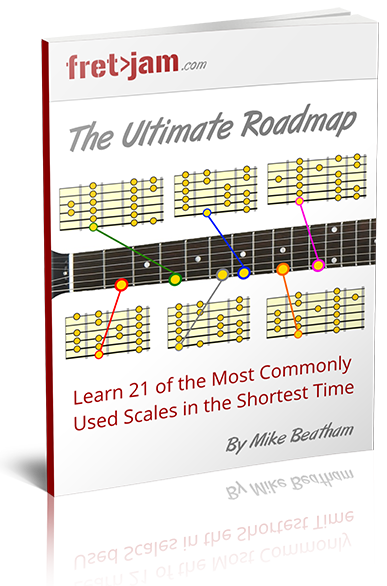 If you want to learn how to use these patterns to unlock more scales, and learn how they connect to related chords, take a look at my Ultimate Roadmap book. All I ask is a donation (of your choosing) for instant access.